The architect who designed the multi-coloured/checkerboard, stilted Sharp Centre for Design (otherwise known as the OCAD building) is preparing to announce his next project. Will Alsop is also known in Toronto for designing the upcoming Westside Lofts on Queen West, and KingTowns condos in King West. 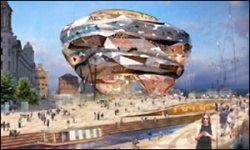 The design Alsop is using will reportedly be similar to or identical to that of the Liverpool "Cloud" Pier Head waterfront project he came up with a few years ago, but was scrapped in 2004 due to budget problems. No word on the cost of the structure, but it's said that the Filmport complex alone will cost around $275-million. Hopefully he'll play nice with the waterfront redevelopment committee as well. Alsop has reportedly said that Toronto is an "incredibly ugly" city in the past. Alleged ugliness aside, Alsop will likely face increased scrutiny from both the city and the public, who saw the original design of the multi-million dollar ROM Michael-Lee Chin Crystal fall far astray from its original entirely glass design. There's word of an announcement coming next week with more details. Is Toronto ready for more over-the-top bold architecture following the lukewarm reception to the ROM Crystal not too long ago?